R.A.G.E. stands for the Resident Association of Greater Englewood. 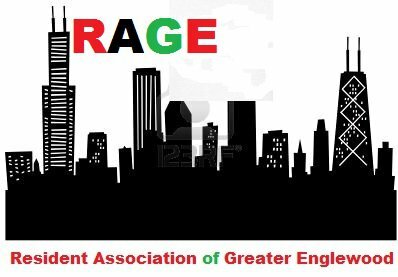 Although an acronym, the name ‘RAGE’ connotes both the extreme frustrations of Englewood residents and also their intense passion and pride for the community. “Rage” can also mean ‘trend,’ ‘craze,’ or ‘eagerly adopted fashion.’ Given the momentum of R.A.G.E.’s success and presence, we feel the name to be quite fitting. What is the current focus of R.A.G.E.? Economic Development Work Group – To assist with strengthening the economic empowerment of The Greater Englewood Community by supporting the stabilization of existing businesses; promoting the development of resident owned businesses and working progressively with internal and external sources to identify and attract more businesses in the Greater Englewood Community. Education & Youth Development Work Group – Advocate for quality education in Greater Englewood, create parent and youth leadership opportunities, programs, campaigns or projects. Civic Engagement – RAGE.COM (Communication, Organizing, and Membership) Work group – Assure RAGE communicates a clear message of our mission and brand using diverse communication mediums. Work group also focus on member recruitment and retention. What does RAGE consider the boundaries of Greater Englewood to be? Currently, the City of Chicago defines the street borders of Greater Englewood to be 55th/Garfield (North), 75th Street (South), the Dan Ryan Expressway (East) and Hamilton (West). This area is covered by Wards 3, 6, 15, 16, 17, and 20. How can I become a member of RAGE? How much is it? To become a member of R.A.G.E., please fill out the membership form and return along with your annual dues. Membership is open to all residents and individuals who have an interest in the betterment of the Greater Englewood community. Members include residents and non-residents of Greater Englewood. There are three levels of membership designed to suit your level of involvement – Executive (Residents Only) Dues $25, Affiliate (Non-Residents) Dues $20, and Associate (General Supporters) Dues $10. All dues support the operations and expenses of R.A.G.E. and ensure membership for one year. Where does R.A.G.E. meet and when is your next meeting? At this time, R.A.G.E. does not currently have a physical location. However, we do meet at various locations in the community to utilize the abundant space readily available to residents. R.A.G.E. public and membership meetings are every other month and often consist of phone conferencing. Workgroups meet as needed. For more information, please see our Events tab. How can I contact R.A.G.E. ?